Why do people love horse-racing? I was never sure why people loved horse-racing so. I wondered if it was that people just love horses, or perhaps that it was the thrill of placing money with a bookie and the possibility of winning, or maybe even the intricate factors gamblers consider when choosing a horse. 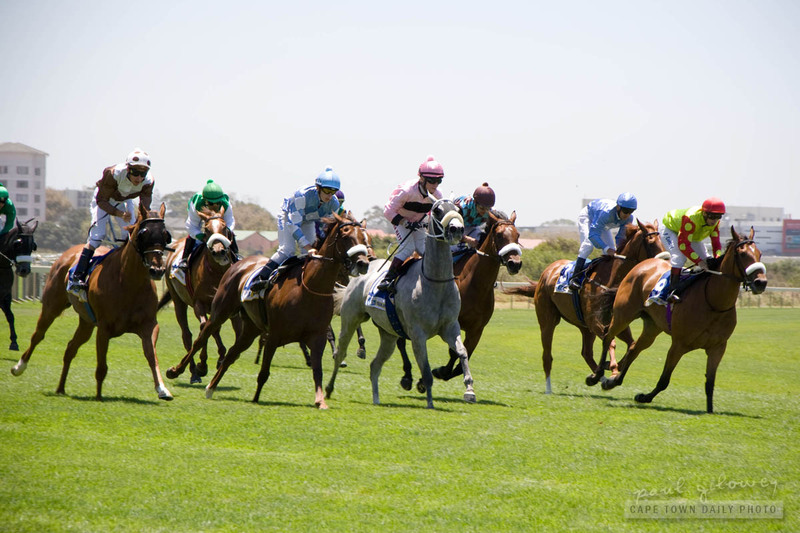 While these are all true, after our time at the J&B Met I've come to believe that the overriding excitement in horse racing is the tension that is built while the horses are on the field. As a dozen horses charge down the field there's nothing quite like hearing the faint sound of 48 hooves crescendo into what sounds like a thousand drums. It's truly an amazing sound! Posted in Events and tagged horse, J&B Met, racing on Tuesday, 1 February, 2011 by Paul. While most visitors to the J&B Met found themselves on the outside of the racing track, we got to hob-nob with celebrities, socialites, and wealthy business people in the J&B Hospitality Marquee on the inside of the track. As you perhaps can tell, we're not socialites, celebrities, or wealthy business people so it took a while for us to become accustomed to being waited on hand-and-foot. But, once we settled into it, it came as naturally as scooping water from a fresh mountain stream. One thing that I haven't mentioned is that while it's obvious that the lady in the photo is Bokang Montjane, Miss South Africa, I have to be honest and say that I have no clue who most of the other celebrities and well-known people that I may or may not have photographed are. So, this is where I'd love some help from you! If you have a little while, please visit our photo album and leave a comment below photos if you recognise the person in the pic. Posted in Events and tagged J&B Met, racing on Sunday, 30 January, 2011 by Paul. 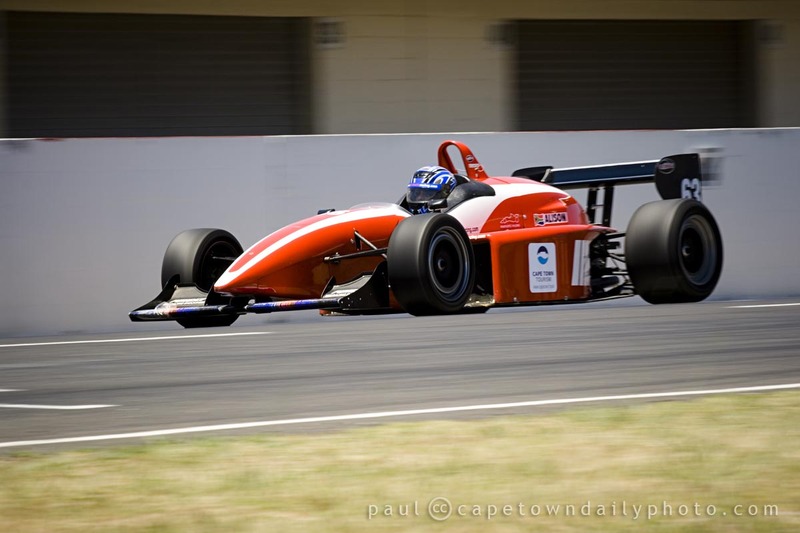 Almost F1-racing at Killarney – you can do it too! 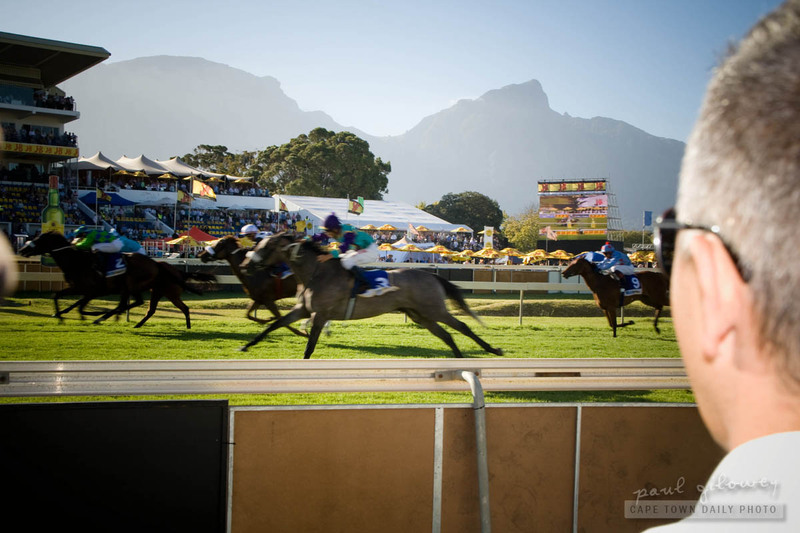 In my previous article I spoke about my outing to the Killarney racing circuit, arranged by Cape Town Tourism and Fantastic Racing. The plan was to show me (and you) what fun can be had taking a few laps in these Reynard racing cars. (See a few more photos from the day in our album over here). 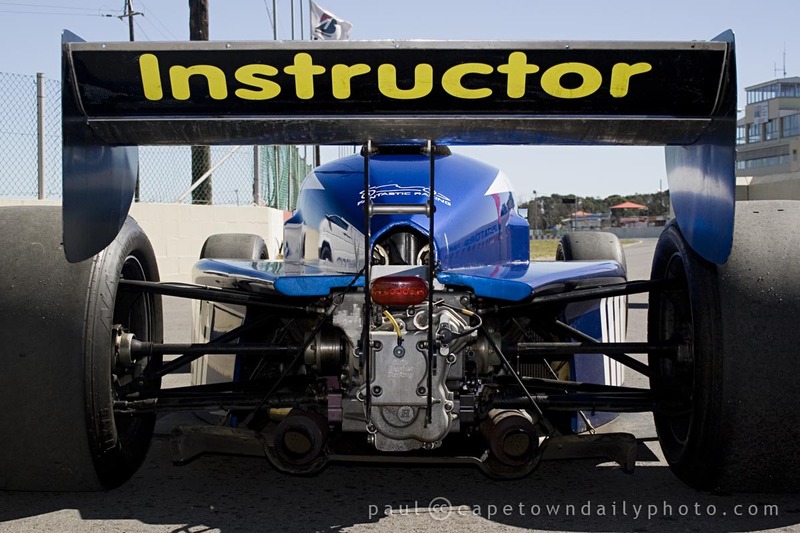 We were given overalls, boots and gloves similar to the ones that you may have seen Formula1 drivers parading around in, and then we sat down while one of the instructors explained everything that we needed to know about driving one of these beasts. On our return to the garage we grabbed our helmets and headed off to the Reynards. Getting into the car was a little tricky (it's a fairly tight fit) but once in I felt pretty snug, and with the 5-point harness, pretty well secured. I quickly tested all the controls to make sure that everything was within reach, fired up the engine, and waited for the marshals to indicate that it was my turn to pull the car forward. Getting going was pretty easy - the speed-machine worked much like any other manual car, except that the gearbox was sequential. This means that you keep pulling backwards on the stick to go from first to second, through to sixth gear and then push forward to go from sixth to fifth, through to first - easy-peasy. We had a little break with some refreshments and a little more instruction from our teacher and then headed off for our second set. This time was even better since I felt in control right from the start and the tips given in the break helped me to know better where to drive and how to get the most out of the Reynard. All in all, it was fantastically awesome and I find myself fighting a motor-racing addition. 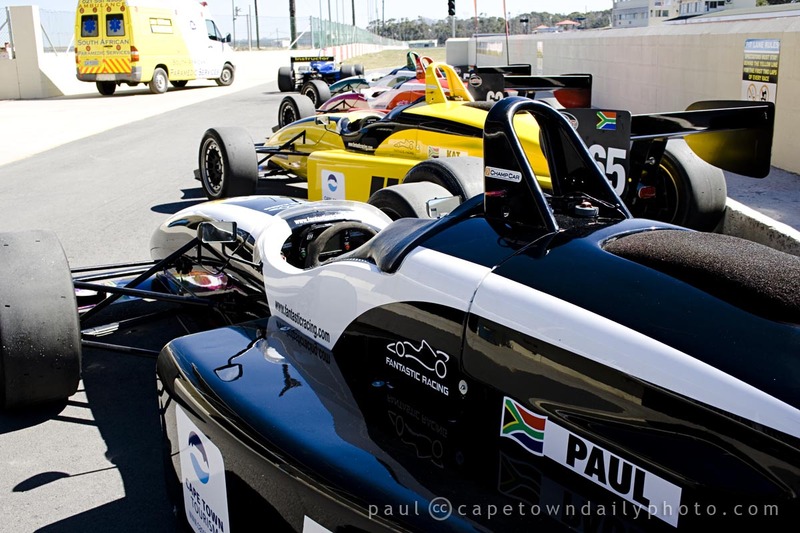 :) The cost ranges from R2,500 to about R4,400, depending on the package you choose, and if you have a need for speed, it's definitely something to add to your to-do list! Thanks to Bianca, Julie, and the rest of the Fantastic Racing team for the rocking morning. If you'd like to enquire about learning to race one of these cars, check out the contact details on this page, and if you'd like a map to Killarney, see the Google Map with the route that I've plotted from the N1 right to Fantastic Racing's doorstep. Posted in Activities and tagged leisure, racing, sport, vehicles on Saturday, 21 November, 2009 by Paul. From the photo you'll notice two things: 1) My name is on the coolest of the six racing cars, and 2) these ain't no go-karts! The machines are fitted with 3.5-litre Dodge V6 engines that produce around 450BHP/t (brake horsepower per tonne) or 335KW. Just before these numbers bore you, let me explain the significance. The Reynard single-seater racing car produces marginally less power than a new Porsche 911 Turbo, which generates around 460BHP/t (350KW). What makes the acceleration on this beast even more awesome is that it weighs a fraction of what a Porsche does and sits really (really) low on the ground. The cars are exceptionally easy to drive and the gear shifts are actually easier than a normal car. As far as acceleration is concerned, when you squeeze the pedal to the floor the grunt of raw power is all you hear as your helmet is forced back into the seat behind you. The only thing that makes driving the Reynard not quite a walk in the park is the lack of power steering - so you have to be prepared to whip up some elbow-grease and teach the racer who's boss. I'll post a little more info in my next article, but for now, visit Fantastic Racing's website for more info. Posted in Activities and tagged racing, sport on Friday, 20 November, 2009 by Paul.